The Z Beat: ZINspiration Mondays! Note: Every Monday, The Z Beat will highlight inspirational ZIN members. Please contact me if you want to be featured here! This week’s ZINspiration comes from Christine Patel of Massachusetts. Two years ago she was a self-proclaimed “fat girl with no confidence,” who lost 50 pounds and now inspires others. 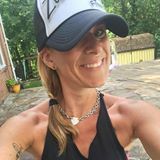 I’ve personally Zumba’ed with her and she’s great – if you’re in MA, go find her classes!! I was B1 Certified in: April 2012, with the amazing Jani Roberts who completely blew me away. The funniest thing that ever happened while teaching was: When I accidentally hit myself in the face doing the merengue fitness version 2 step… ouch. Zumba has impacted me: In so many ways. I don't even know where to start. It's changed my life. It's given me confidence and pride in myself. I love what I do!!!!!! My best advice for new ZIN members is: Learn from the ZIN volumes. Take your time learning B1 and understanding all the core moves. When choreographing keep it simple – limit yourself to 3 moves and progress them. Smile. Have fun. Don't stare at yourself in the mirror. Look at your class and have fun with them. They will feel your energy. I'm born and raised on Long Island, NY and recently move to Massachusetts. I am a licensed AFAA group fitness instructor, privately insured, CPR/AED, and a licensed HitZJam instructor.